The Hydrostatic glass is a classic effect in magic and there must be 100's of marketed versions. We like the fact that this comes with a regular Drinking Glass that is actual glass. Many professionals like Bob Sheets and Alan Shaxon use it in their working repertoire because the effect itself is nothing short of miraculous! The performer fills a tall glass with water, milk, wine, or even an ICED BEVERAGE! Placing a small slip of paper over the mouth of the glass, the performer inverts the glass to its upside down position. Miraculously, the liquid remains inside the glass, apparently being held in place by the slip of paper. Here's the killer: the performer slowly peels the paper away and the liquid remains inside the inverted glass! A spectator is selected to yell out the word "Go!" at any time. Once he does so, the liquid splashes out from within the glass as if by the spectator's very command! Perfect for any type of performer whether you are a magician, mentalist, science teacher, children's performer, or MC! 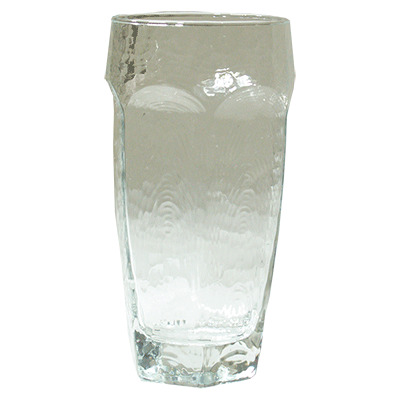 The Superior Hydrostatic Glass is incredibly well made of real etched glass, measures a full 16 ounce size/weight and is even dishwasher safe, allowing you to use any liquid you like! This is a heavy-duty, professional quality apparatus that will last you forever! The gimmick itself is made from durable Plexiglas, and the entire effect comes complete with detailed instructions! Don't let this one get away! Package includes the necessary 16oz glass.